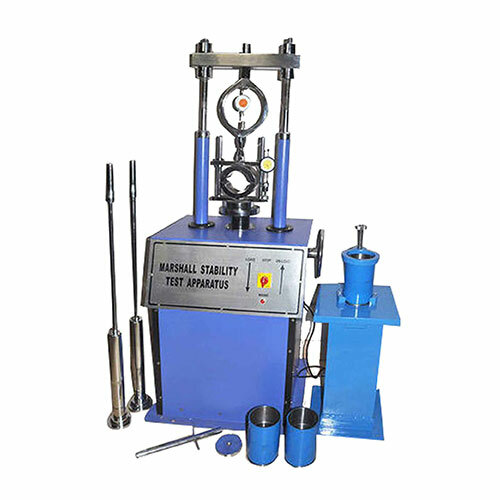 Marshall Stability Test Apparatus Description:SE-Test India’s Marshall Stability Test Apparatus, Model No. SET-1310 is manufactured as per the ASTM: D 1559 T- 62 & BS 598-107 industry standards. Marshall Stability Test, a robust construction, is intended or used to measure the resistance to the plastic flow of cylindrical samples or specimens of a bituminous paving mixture that is loaded on a lateral surface. The Marshall stability of mix, at a standard 60ºC temperature, is defined as a maximum load carried by the compacted specimen. In this an attempt is made to determine the optimum binder value of the content for the aggregate mix type and traffic intensity. Comes with a capacity of 50 KN. Offers 50.8mm/min rate of travel. Safe & secure as cut-off switch is available. Consists of body housing and a geared screw jack with motor drive mechanism. Supplied with one Marshall Load frame. For flow measurement, comes with one breaking head stability mould equipped with a dial gauge (of 25mm travel with least count of 0.01 mm). Three steel cylindrical compaction mould. 3 Base plates & 3 extension collars. For manual operation, a compaction pedestal comprising of a steel plate capped on the wooden post. One mould cap is also fitted on the top of the plate. Two compaction hammer with 4535g siding weight with a free fall of 457mm. One bar for load transfer. One packet (100 no.) of Paper Discs of 11 cm diameter (non-absorbent). Voltage: 230 V A.C. of 50 Hz with single phase supply.